The carpentry team also installed the bottom stair rail with white spindles. There are several options available from simple Drywall Half-walls, to wood spindles like ours and even wrought iron bent into decorative shapes. We chose the wooden spindles for their low cost compared to iron, yet giving us an open, airy feel for the entry to our home. The wood will be stained to match the floors as well as the wooden steps. We choose a half-wall at the top of the stairs for the simple reason that it allows a sturdy mounting point for a baby gate to prevent our toddler from falling down the stairs. Most people think that having a beautiful home equates to spending a lot of money on professional contractor fees and charges. However, you can perform many procedures by yourself, as long as you have the skills and the tools that are necessary for the job. Installing stair rails, for one, involves a very simple procedure despite the fact that it increases the safety and the aesthetic quality of your home. Here are some of the basic things that you should understand about the process, all of which you may use to install your stair rails yourself. Make sure that you keep the following considerations in mind as you go about the process, to ensure that you will be able to carry out the process effectively. The first thing that you have to do in the process of installing stair rails is to decide where it will be best for you to place them, your basic layout of the rails. Get your measuring tape and measure the length between the top landing and the bottom landing of the stairs. After you get the exact measurement, make sure that you add around two feet to your measured figures, to make room for possible mistakes. Use these figures to decide how much railing material you would need to purchase. Of course, it will be better if you buy more than you actually need especially if you have no previous experience in performing this type of task. This will ensure that you will be able to finish the job once you start. Your best bet would be to go to your local hardware store and purchase pre-cut and finished railings. They come in a kit with everything you need included. All you have to do is pick out a style that fits your home and install them. Balusters, handrails, spindles and newels are the main components of a staircase railing. The thick post that supports a handrail at its end is a newel. Balusters are the thinner posts that support a handrail from underneath. Spindles help support hand railings. 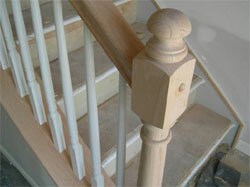 Spindles offer added safety to prevent slipping and falling between the hand railing and staircase. Spindles come in a wide variety of shapes and sizes. Make sure that you create a comprehensive list of the different materials and tools that you will need for the job. Besides your basic carpentry tools; you will need carpenters glue, gorilla glue, drills, a mitre saw, bolts, and screws. Follow the manufacturer's directions for appropriate sizes. The amount of materials that you need will depend on the length of the area where you want to install your railings. Make sure that you get enough materials to cover the whole length of the stairs, so that you will not have to stop once you have already begun the process. Do not start the process until you are a hundred percent sure that you have all the materials and tools that you need. Before you being the process, you should decide whether the railings that you bought are of the length and height that will suit best for your purpose. If it is too long or too tall for your stairs, then you have to do some trimming. Make sure that you use the necessary tools for this step, because you stand a good chance of damaging your rails if you do not use the right type. Try to do the trimming little by little as well, to avoid cutting the railing too short or too low. Get the help of an assistant in seeing whether the trimmed railing fits the area perfectly, before you go on to the task of installing it. Installing stair rails is not an easy job. If you take your time, you should have no problems completing the job successfully.